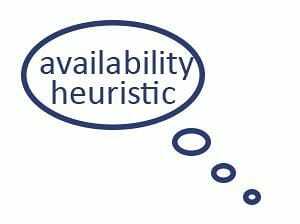 The availability heuristic, also sometimes referred to as availability bias, is a cognitive bias that can cause people to incorrectly assess the likelihood of events. In particular, when we are asked to estimate the likelihood of a particular event, we will often rely on our memory. This makes sense. If it’s easier for us to recall an instance of an event in the recent past, then it’s probably more likely to occur than events for which we have no recollection. However, the extent to which we can remember an example of an event strongly upward biases our estimates on likelihood of events. Let’s consider two examples. First, let’s try to estimate the likelihood of being involved in a car accident in any given year. The vast majority of people will not have been involved in a car accident recently. As such, these people will not be able to recall an example of a car accident. In other words, they don’t have an instance ‘available’. However, people who experienced a car accident will have a strong recollection of the event. The consequence will be these people will considerably overestimate the likelihood of becoming involved in a car accident. The availability of a recent experience will upward bias their estimate. As a second example, consider the recent financial crisis. The steep decline in stock prices caused a lot of investors to turn their back on stock markets. One reason is that investors judge the probability of another stock market crash to be quite high. Even though the recent financial crisis was a once-in-a-lifetime event, the fact that they recently experienced such a crisis, upward biases their expectations. The availability heuristic biases the investors’ estimates of the the likelihood of certain events. As we just discussed, recent (personal) experiences can cause likelihood estimates to be biased.